In a previous update, we overhauled the project tab for open projects and documents. And now we are taking it one step further by allowing you to drag reorder open tabs. Simply grab the tab (active or inactive) and drag it into position. You can also use keyboard shortcuts cmd/ctrl + shift + arrow key to move the active tab. Quite a few of you requested the ability to key in precise pixel values for position and size. Indigo Studio always supported entering height and width values, but was one-click down. Now there is a new section in the property editor for location and position. The auto-height and width options are also readily available. It’s a small thing, but we understand that it makes it easier to glance at the size and position values. And one more thing, you can use the up/down arrow key to increase or decrease the values in the editor. You can now refresh the project home without having to close and reopen the project to see changes made in the file-system. Instead of a simple refresh, Indigo Studio will notify you of any changes made in the file system. This can be handy if other users are making changes to documents you have open in your project. 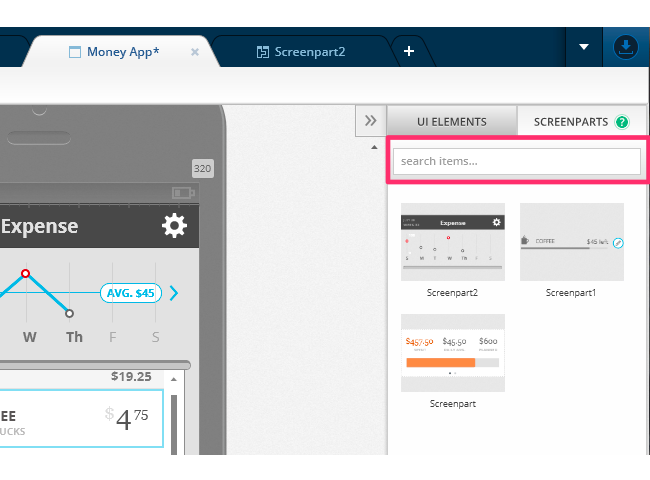 The screenparts under the screenparts tab in your toolbox are now searchable. So go ahead and fill it up without worrying about quickly locating one. You can also right click and delete the screenpart right from the toolbox. And yes, delete key will also work. The image picker now remembers the last sort order you selected. That is, by recently changed or by name. We also show you the image name or date info depending on the sort order selected. You may have noticed that the property editor sometimes gets in the way when you are multi-selecting UI elements. It’s now more intelligent and hides itself when you begin multi-selecting. Let us know how it’s working out for you. The UI elements now have a hover style when you try to select and drag one from the toolbox. If you have the option to automatically check for updates on startup checked, you should see a dialog box pop up when you launch Indigo. Simply click update, and Indigo Studio will do the rest. This is the easier approach. If for some reason you chose not to automatically check for updates, go to MENU > HELP & ABOUT and use the "CHECK FOR UPDATES" option. Don't have Indigo Studio? 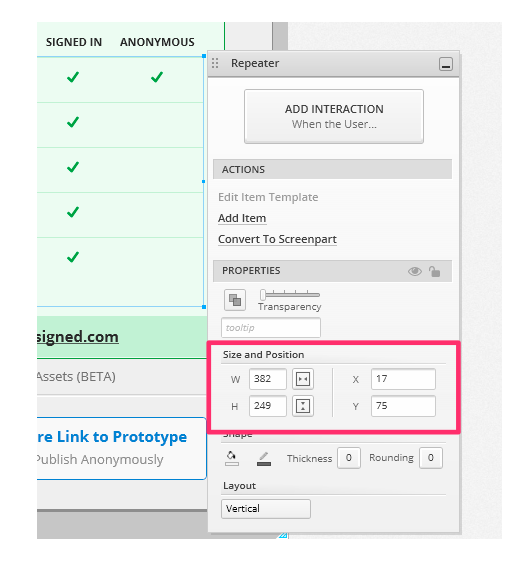 Download a free 30-day trial which will let you try all of the prototyping goodness! Looking to suggest improvements and new ideas for Indigo Studio? 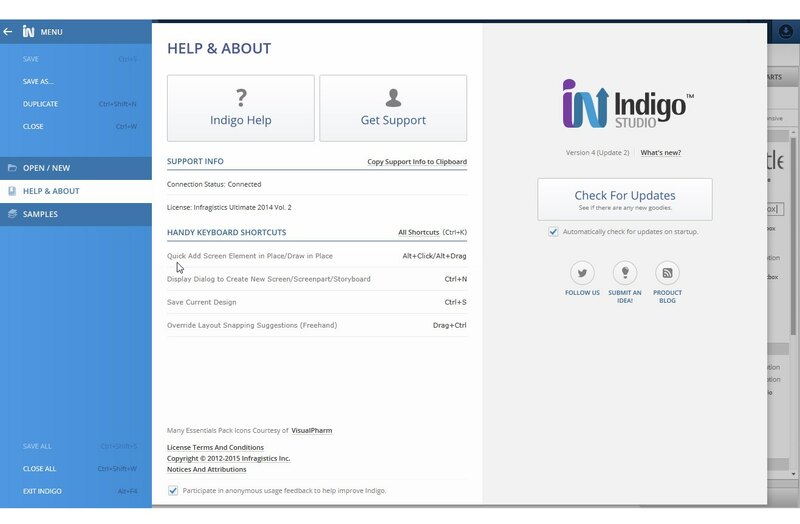 If for some reason you are having trouble with Indigo Studio, check out our help topics, forums or contact support.